The landmark nuclear deal with Iran, known as the Joint Comprehensive Plan of Action (JCPOA) turned two years old on July 14. Yet two years after it was agreed to, and 18 months after the start of its implementation, the public has no clear sense of how the agreement is functioning. One of the main reasons for this uncertainty is a lack of public transparency. Only the governments who are party to the agreement are being kept informed about its implementation. As a result, governments not party to the agreement, private experts, and the public at large cannot evaluate the JCPOA’s operation and effectiveness. Such an evaluation is especially critical now, when the Trump administration is deciding whether the United States should remain in the agreement, whether to issue favorable certifications required by Congress, and whether to continue to waive sanctions. Whatever is decided on certification will be contentious. At present, any public debate will be largely uninformed and subject to the vagaries of unsubstantiated assertions. On July 7, 2017, the Wisconsin Project on Nuclear Arms Control brought together an expert panel for a private discussion aimed at developing a plan of action for increasing transparency. Specifically, the panel considered how to change the practices of the institutions responsible for implementing the JCPOA, in favor of increasing public information about the agreement. The institutions include: the International Atomic Energy Agency (IAEA), which conducts monitoring and verification to ensure that Iran respects the restrictions set forth in the JCPOA and is not conducting undisclosed nuclear work; the Joint Commission, a consultative body created by the JCPOA to adjudicate disputes and review nuclear program and exemption requests; and the U.N. Security Council, which has ultimate oversight authority of the agreement and related restrictions on arms trade and ballistic missile work. These institutions are moved by their constituent governments, including the United States. Achieving greater transparency, therefore, will require direct engagement from the U.S. administration and other governments. Congress also could play a pivotal role, whether on an ad-hoc basis by engaged members, through action by the committees of jurisdiction, or through a new formal arrangement such as a congressional commission. In addition, other state parties to the agreement could press for greater transparency on implementation and encourage Iran toward greater openness. The panel discussion was held in Washington D.C. and moderated by Valerie Lincy, executive director of the Wisconsin Project. The participants were Susan Burk, former Special Representative of the President for Nuclear Nonproliferation and now an independent consultant on arms control and nonproliferation, Mieke Eoyang, former congressional intelligence staff member and now Vice President for the National Security Program at Third Way, David Kay, former Chief Nuclear Weapons Inspector at the IAEA and now Senior Fellow at the Potomac Institute for Policy Studies, John Lauder, former Director of the DCI’s Nonproliferation Center now an independent consultant on nonproliferation and arms control, Edward Levine, a retired senior professional staff member of the Senate Foreign Relations Committee and now chairman of the board of the Center for Arms Control and Nonproliferation, Stephen Rademaker, former Assistant Secretary of State for International Security and Nonproliferation, and William Tobey, former Deputy Administrator for Defense Nuclear Nonproliferation at the Department of Energy’s National Nuclear Security Administration and now Senior Fellow at Harvard University’s Belfer Center for Science in International Affairs. The discussion took as a starting point a recent report on transparency and the JCPOA published by the Wisconsin Project. If the United States continues to adhere to the JCPOA, the panel agreed that more Congressional engagement would be desirable. One method would be through the creation of a congressional-executive commission to ensure sustained attention to the agreement’s implementation and to prepare for the agreement’s long-term consequences. Congressional action would require overcoming the continued reluctance among members of congress to either engage with the details of the JCPOA or to take action that could reveal its shortcomings. The result of increased transparency would be greater public understanding of the monitoring and verification mechanisms of the agreement; the goal would be increased confidence in these mechanisms. In addition, the public, the non-governmental community, and countries not party to the agreement would be better armed to evaluate the agreement’s implementation, Iran’s performance, and the implication of Iran’s nuclear plans. Increased transparency also could be a step toward greater openness in Iran’s military and nuclear energy programs and in its relationship with the rest of the world, which JCPOA supporters hoped the agreement would deliver. Following are the roundtable’s findings, which are a composite of the panelists’ individual views. No finding should be attributed to any single panelist or be seen as a statement of the policy of any organization with which they are affiliated. Public transparency was a critical part of nuclear diplomacy in advance of the JCPOA and is equally important now. It is essential for achieving an accurate understanding of Iran’s compliance with the nuclear agreement and whether U.S. national security interests are best served by continued adherence to the agreement. A great deal of information was made public about Iran’s nuclear program before the JCPOA, whereas there has been a return to greater secrecy and less public transparency since the agreement’s implementation. There was widespread government support for releasing public information about Iran’s nuclear program before July 2015. It was a means of supporting the international sanctions campaign aimed at bringing Iran to the negotiating table and of increasing leverage against Iran once negotiations were underway. After July 2015, there was a concern among governments party to the agreement that transparency would provide ammunition to those opposing the agreement. This shift was characterized by one panelist as a return to the operational norm of foreign policy and intelligence officials. The panel agreed that there was a strong public interest in reversing the current trend toward secrecy and increasing the amount of publicly available information about the agreement’s implementation. This information is needed so that Congress and the public may evaluate the executive branch’s assessment of Iran’s compliance. Such an assessment is required every 90 days by the Iran Nuclear Agreement Review Act of 2015 (INARA). In addition, whether the United States decides to continue to adhere to the JCPOA or decides not to, the decision will have international consequences; the public and U.S. allies must have sufficient information to understand the basis for the decision. Under INARA, the president is required to certify to Congress every 90 days that Iran is “transparently, verifiably, and fully implementing the agreement,” that Iran has not committed a material breach of the agreement, has not taken any action that would advance its nuclear weapons program, and that the continued suspension of U.S. sanctions is both “appropriate and proportionate” to the nuclear measures taken by Iran and in the national security interest of the United States. In the Trump administration’s first certification to Congress in April, Secretary of State Rex Tillerson announced that the administration was conducting a National Security Council-led interagency Iran policy review, including a review of the JCPOA and whether continuing to suspend U.S. nuclear-related sanctions is in the national security interest. A second certification took place on July 17, reportedly following a strong objection by the president. There is a growing concern that the administration will decide not to issue a certification at the next deadline, in October. If it does not, a 60-day clock starts, during which Congress may introduce a bill re-imposing the nuclear-related Iranian sanctions that have been waived since the implementation of the JCPOA. To inform their vote, members of Congress would need information about the implementation of the agreement and the functioning of its monitoring, verification, and enforcement provisions. One source of such information is reports that INARA requires the administration to submit to Congress every 180 days. These reports are being provided on a classified basis to certain congressional committees. The panel agreed that these reports could usefully be made public, either entirely or in summary form. According to INARA, these reports must include the following information: any instance where Iran failed to comply with its JCPOA obligations; any delay of more than a week in allowing inspectors access to facilities, persons, or documents; any procurement of materials that could advance Iran’s nuclear weapon capability; any instance of noncompliant centrifuge research and development or any centrifuge research and development advances that may substantially reduce Iran’s breakout time; and any covert nuclear activity or diversion of uranium, carbon-fiber, or other sensitive material. The reports also must cover activities of concern not addressed by the JCPOA, such as ballistic missile advances, money laundering or terrorist financing, acts of terrorism, and human rights violations. A majority of panelists found that a public version of the INARA reports should include such information in order to be useful. These reports would help the public understand the U.S. government’s decisions. If the administration or Congress decide to stop waiving sanctions, and the JCPOA falls apart, this will be a far-reaching change in U.S. policy with regard to Iran. The public would need to understand the reasoning that led to such a decision, and the reasoning behind any alternative policy, such as a new U.S.-led sanctions campaign. So too would U.S. allies, particularly those who support the JCPOA, and who have begun engaging in trade with Iran and would be called upon to participate in new sanctions. Similarly, if the administration decides to stay within the JCPOA and continue waiving sanctions, the public should have information about the reasoning supporting that decision. While acknowledging the value of greater transparency, the panel also pointed out that there are risks. Revelations about Iran’s failure to comply with certain restrictions or evidence that Iran is exploiting ambiguities in the agreement could be used by opponents of the JCPOA to argue for leaving the agreement. In this way, transparency would be used as a weapon against the agreement, rather than a positive operational norm. Some panelists found that quiet diplomacy in some cases may be a better way of resolving disputes, rather than litigating them in public. The administration should urge the IAEA to increase the detail in its quarterly inspection reports. Before the JCPOA, the IAEA produced quarterly inspection reports with a detailed accounting of Iran’s nuclear status, including the number of centrifuges operating, the amount of enriched uranium produced, enriched uranium stockpiles, and research and development work on advanced centrifuges. Since implementation of the agreement, these quarterly reports contain a reduced breadth and depth of information. The reports only state, in general terms, that Iran is adhering to the restrictions set forth in the JCPOA. This limits the ability of outside experts to properly assess Iran’s nuclear status, and it limits the public debate about how the agreement is working. The IAEA attributes the change in reporting to a change in the basis for inspections in Iran. Past resolutions by the Agency’s Board of Governors and by the U.N. Security Council were motivated by Iran’s noncompliance with its obligations under the Nuclear Nonproliferation Treaty. The resolutions condemned much of Iran’s nuclear work and asked the IAEA to report on Iran’s implementation of the restrictions demanded by the Security Council. In resolutions adopted following the conclusion of the JCPOA, the IAEA’s role is to verify and monitor Iran’s adherence to the agreement. However, the panel found that the reduced information included in IAEA reports is also due to a decrease in the extent to which IAEA member governments are pressing for detailed public reporting. In the run-up to the conclusion of the JCPOA, the United States and some of its negotiating partners pressed for detailed public reports about Iran’s nuclear program as a bargaining tool to move Iran toward an agreement. After the deal was implemented, the United States and Iran both advocated for less information to be made public. Likewise, the IAEA was more comfortable returning to its tradition of confidentiality in the nuclear safeguards area. Most panelists felt that the IAEA’s decision was essentially a political one and that effective pressure could persuade the Agency’s Director General to publish more detailed quarterly reports. Much of the information related to JCPOA implementation would not normally be classified as safeguards confidential and thus could be made public. The panelists agreed that the Director General would be willing to provide more information in quarterly reports if he perceives an appetite for a return to comprehensive reporting. The United States should make its interest in such reporting clear. Several panelists recommended that the United States do so through quiet diplomacy, rather than being publicly critical of the Agency or engaging in protracted and contentious disputes in the Agency’s board of governors. The panel also agreed that the United States should convince European allies to join in this quiet diplomacy with the Director General. Some panelists noted that a more public pressure campaign with the IAEA could also be effective. One example cited was the result of inaccurate German media reporting in the 1990s, based on confidential safeguards implementation reports. The media attention prompted the then-Director General to have the reports redrafted in a form that was releasable to the public. In the case of Iran, it may be that the nonproliferation community and transparency advocates successfully could come together to argue that it is in the public interest to release more information about Iran’s adherence to its JCPOA obligations as well as Iran’s future nuclear plans. The like-minded group could argue that the nuclear proliferation and regional implications of the JCPOA make such a public release necessary. The panelists found that there are indications that the Agency is willing to include more information in its quarterly reports. For example, the IAEA’s June 2017 report stated that its verification and monitoring of Iran’s commitments not to undertake work listed under Annex I, Section T of the JCPOA continues. This section of the JCPOA covers “activities which could contribute to the design and development of a nuclear explosive device.” Similarly, the IAEA’s February 2017 report included a breakdown of the various forms in which Iran’s permitted enriched uranium stockpile is held. In both cases, this marked the first time that the Agency had included such information in its reports since the JCPOA was implemented. The administration also should urge the IAEA to explain publicly its methods for ensuring that Iran is not conducting nuclear work prohibited by the agreement. The IAEA inspection process is critical to verifying not only that Iran is not using known nuclear sites to conduct work prohibited by the JCPOA, but also that Iran is not conducting such work at undeclared sites, including military sites. Recent IAEA quarterly reports make reference to “complementary access” by inspectors “to sites and other locations in Iran,” pursuant to Iran’s obligations under the Agency’s Additional Protocol. This Protocol requires Iran to open additional sites to inspectors and to provide a greater amount of information about its stockpiles and nuclear plans. However, the reports contain no information about the sites inspected under such “complementary access,” how many of these inspections have taken place, or the method of inspection. As a result, little is known publicly about how the IAEA is ensuring that Iran is not using undeclared sites to conduct proscribed nuclear work. The panel recommended that the administration strongly encourage the IAEA to include more information in public reports about its verification work at such sites. The number of inspections at undeclared sites and summary results could provide assurance that the process is working. In particular, the value of the verification process would increase if the IAEA confirmed publicly that it was being allowed access to military sites and that such access did not endanger legitimately secret information. Such information also would provide insight into Iran’s willingness to cooperate with inspectors. The panel agreed that the information released to the public need not be exhaustive. If releasing the detailed information included in pre-JPCOA reports is not possible (such as inspection dates, site names, personnel interviewed, questions asked and answers received), the panelists recommended that the IAEA publish its methodology for accessing undeclared sites. For example, the Agency could define the difference between an on-site inspection and a site visit and describe the procedures and technology used to conduct inspections or visits at military sites. The IAEA could also release images of on-site inspections, showing inspectors and Iranian officials working together, or dismantled or repurposed equipment. Such imagery had a positive public relations effect in past arms control and arms reduction agreements. Some panelists expressed concern about the precedent set by the IAEA’s inspection of the Parchin military site. Parchin was allegedly the site of high explosives tests with nuclear weapon applications and the IAEA had been seeking unfettered access to the site for years, as part of its investigation into possible military dimensions of Iran’s nuclear program. One-time access was ultimately granted by Iran in September 2015, after the JCPOA was concluded. However, the IAEA did not release the verification procedures for this access, which reportedly included Iranian officials carrying out environmental sampling and IAEA inspectors monitoring the process remotely. Nor has the Agency returned to the site to further investigate the result of environmental sampling, which uncovered small quantities of “chemically man-modified particles of natural uranium.” The panel found that the IAEA should not replicate the inspection methodology used at Parchin, which limited its ability to independently and fully verify what took place at the site and compromised the IAEA’s standard safeguards practice. The administration should use its voice in the Joint Commission to strongly encourage more transparency in the decision-making process. The Joint Commission is a consultative body created by the JCPOA that includes each of the countries party to the agreement, including Iran, as well as the European Union. The Commission meets at both the ministerial level and working-level, and oversees several subject-specific working groups. According to the JCPOA, the Commission has broad responsibility and authority. It adjudicates disputes among parties, including those related to nuclear inspections and site access, it grants Iran exemptions from certain nuclear restrictions, and it reviews nuclear technology procurement requests. The Commission operates confidentially and is not required to issue any public reports about its deliberations or decisions. The panel agreed that the level of secrecy under which the Commission operates is high compared to the consultative commissions of other arms control and nonproliferation agreements. The JCPOA allows the Commission to “adopt or modify, as necessary, procedures to govern its activities.” The panel found that the United States, as a member of the Commission, could effectively persuade the Commission to do so in favor of greater transparency. The United States could also encourage other Commission members, specifically France, Germany, and the United Kingdom to do the same. There was some disagreement among panelists about how much of its work the Commission should make public. At a minimum, the Commission should release non-controversial items, for example meeting photos and a summary press release before and after political and working-level meetings. The Commission could also release information about the structure of its working groups, describing the number and level of technical experts, the frequency of meetings, and a summary of the topics under discussion. The panel noted that the Commission lately has shown some openness with regard to more sensitive information, such as its decisions. In late 2016, it released documents related to past decisions, including several nuclear exemptions granted to Iran in advance of JCPOA implementation, which dispensed Iran from meeting some of the nuclear restrictions the JCPOA was designed to impose. Iran presumably accepted this release, given that such Commission decisions must be made by consensus. The precedent set by this release is encouraging, and should be used to pave the way for the release of decisions in the future. Some panelists noted that the decisions should be released in a timely and comprehensive manner; the 2016 release included decisions that had been made one year earlier. These panelists concluded that the United States could lead a successful effort to modify the rules governing the release of Joint Commission decisions, either directly or procedurally. Similarly, the administration should encourage the Commission to release information about its role in adjudicating requests by the IAEA for access to undeclared sites in Iran suspected of nuclear work. Under the JCPOA, such requests are reviewed by the Commission if the IAEA and Iran are not able to come to an arrangement directly. This is one of the few areas in which the Commission does not operate by consensus; five of eight members can compel Iran to open a site, including a military site, to inspectors. As described above, little is known publicly about how this this process is functioning, and whether the Commission has been petitioned by the IAEA. Confidence in the JCPOA requires confidence in the ability of inspectors to gain access to suspicious sites. The panel acknowledged that governments may feel they have sufficient information about how this process is functioning. However, most panelists agreed that it would increase confidence in the agreement if the Commission released some information publicly about its role in this process. Some panelists also found that the United States could do more on its own to increase the amount of information about the Joint Commission in the public domain. For instance, U.S. representatives to the Commission and its working groups could hold occasional off-the-record or on-background briefings with key journalists, following meetings. Such briefings have been a feature of the implementation of other arms control and nonproliferation agreements. The administration should urge the U.N. Security Council to make nuclear procurement requests submitted on behalf of Iran, and their approval or denial, more widely available. The JCPOA reversed the basis for most nuclear trade with Iran. Prior to the agreement, Iran was prohibited by the U.N. Security Council from procuring most nuclear technology, with some exceptions made for its light water power reactor program. Since the agreement’s implementation, Iran has been permitted to procure most nuclear technology listed in annex to Nuclear Supplier Group (NSG) guidelines. These annexes list “items that are especially designed or prepared for nuclear use,” as well as “nuclear related dual-use items and technologies.” However, for ten years, Iran must conduct most such procurement through a newly-created nuclear procurement channel. Proposed sales are submitted to the Security Council by exporting countries and passed on to the Joint Commission’s Procurement Working Group (PWG). This group reviews and advises the Security Council on each proposed export. As part of the Joint Commission, the PWG also is governed by rules of confidentiality. Therefore, the increased flow of nuclear technology to Iran is not matched with a corresponding flow of public information about that technology or the criteria used to decide whether or not to approve its export. Nor is it clear if the information is disseminated beyond the Security Council and the Joint Commission. The panel found that both approved and denied procurement requests should, at a minimum, be shared with NSG member countries. The NSG has a system in place through which countries share denial information, though this information is not made public. If items proposed for export to Iran are listed in NSG guidelines, and the exporter is an NSG member, then the exporter should report any export denials to the NSG. The United States should press for such intergovernmental information sharing, which would support the argument that the JCPOA strengthens the overall nonproliferation regime by ensuring cross-sharing of information among different parts of the regime. One panelist noted that the information should be circulated more widely than the NSG, to ensure that all potential nuclear suppliers, including non-members like India, are aware of Security Council procurement decisions. If Iran is denied the purchase of certain sensitive nuclear-related items, it is critical that all possible supplier countries are made aware of this decision. Summary information about the procurement process has been publicly released through biannual implementation reports by the U.N. Secretary General and a specially designated U.N. Facilitator. According to the most recent Facilitator’s report, published in June, a total of 16 export proposals have been made by four countries, including some not party to the JCPOA. Since the beginning of 2017, out of ten proposed exports, five have been approved, one was withdrawn, and four were still under review. The report says that these proposed exports were from the NSG’s list of dual-use material, equipment, or goods and technology. The report does not specify the items themselves, or their proposed end user or end use. The panelists were divided on whether it would be constructive to release this information to the public, and the degree to which the United States should advocate doing so. Some panelists pointed out that it may include proprietary information; others noted that once exports had been approved, even Iran should not object to publicizing them. There was general agreement among the panelists that the PWG and the Security Council should at least be more publicly transparent about their decision-making criteria regarding procurement. As a member of both, the United States is well placed to advocate for such transparency. If the United States continues to adhere to the JCPOA, the certification process required by INARA could provide leverage for the administration to press for greater public transparency at the IAEA, the Joint Commission, and the U.N. Security Council. Effectively doing so would improve the agreement’s implementation. The recurring JCPOA certification process required by INARA raises the question of continued U.S. participation in the nuclear agreement on a regular basis. As described above, this process involves the administration certifying to Congress every 90 days that Iran is implementing the agreement and that it is in the national security interest of the United States to continue suspending certain sanctions. The next certification deadline is in mid-October. Related to this certification, the administration is required to issue national security waivers in order to continue providing the sanctions relief outlined in the JCPOA, generally every 120 or 180 days. The Trump administration issued its first waivers in May and will be called upon to do so again this month. This process too regularly raises the question of U.S. participation in the JCPOA. These deadlines provide an opportunity for the administration to advocate for increased public transparency among the institutions implementing the agreement. Such increased transparency, if achieved, would serve to strengthen the JCPOA and create a public impetus for enforcement. The panel found that the administration then could argue that it had won improvements to the agreement over the status quo, thereby helping achieve the “better deal” promised by the president. For example, the IAEA could provide greater detail about its nuclear inspections in quarterly reports. The Joint Commission established by the JCPOA could be more open about its deliberations and decision-making process. And the U.N. Security Council could share more about the nuclear technology procurement process. The specific actions that each institution could take are described in separate findings above. The administration could also rally governments party to the JCPOA to this transparency campaign, which would have an amplifying effect. The panel recognized that Iran is certain to object. Iran has strongly objected to the public release of information about its nuclear activities and its argument has gained currency since JCPOA implementation. The panel supported an effort to convince Iran of the benefits of increased transparency, including as a way to build great confidence in the international business community for increasing investment and trade with Iran. Some panelists warned though that such an effort would be unlikely to succeed and Iranian opposition should not be allowed to prevent increased openness. If the United States continues to adhere to the JCPOA, a congressional-executive commission should be created to support implementation of the agreement, to prepare for its long-term consequences, and to ensure that a commitment to public transparency continues through its lifetime. The Trump administration has undertaken an interagency Iran policy review, which includes assessing the value of the JCPOA. The panel agreed that until this review is complete, and the fate of the nuclear agreement is decided, Congress would not create a new body to monitor the agreement. If the administration continues to adhere to the JCPOA, the panel agreed that it would be useful to create a congressional-executive commission to monitor the agreement’s implementation. Such a commission could contribute to public transparency by holding public hearings and by issuing unclassified reports. The commission could provide several benefits. First, it could build expertise on Iran among the members of Congress who serve as commissioners. Second, a commission would be able to recruit expert staff to support its work, including those with experience in assessing monitoring efforts, a nuclear physics background, or those with Farsi language skills and regional expertise. Third, it could devote sustained, specialized attention to the agreement during its fairly long lifetime, whereas the committees of jurisdiction in Congress are captive to the news cycle and may increasingly be focused on more immediate threats. This will be especially important when constraints on the development and testing of more advanced centrifuges begin to loosen in seven years, and when limits on the number of centrifuges Iran may operate and the amount of enriched uranium it may stockpile are removed in eight-and-a-half years. One panelist noted that Iran is unlikely to materially breach the agreement; rather, Iran will continue to exploit ambiguities in the agreement and commit violations short of such a breach. Therefore, the commission should not be focused exclusively on verification of the agreement’s specific nuclear restrictions. It should also assess Iran’s nuclear ambitions based on its overall actions, its engagement with the IAEA, the Joint Commission, and the Security Council, and its likely nuclear capability at the end of the agreement. For instance, the commission could judge whether Iran, based on its actions, has made a decision to reverse its nuclear weapon ambitions. Such a judgment would be important to the public debate about the post-JCPOA nuclear threat posed by Iran. One panelist said that the commission should expire 90 days after the expiry of the nuclear agreement, or if the United States withdraws, whichever comes first. A new commission focused on Iran could be modeled on the Helsinki Commission, which consists of members from both Congress and the executive branch and has fostered a productive partnership between these two branches of government. Over time, the Iran issue may lose salience and therefore receive less attention and resources from the administration. An Iran commission would likely find willing collaborators in the executive branch, for instance in the State Department, who may become frustrated by a growing lack of interest in their issue area. A commission could ensure that resources for monitoring remain committed to Iran over time, including intelligence resources and funding for national laboratories that support the IAEA monitoring and verification process. It would also encourage better information flow within the government, as an aggressive consumer of information from multiple executive agencies. Among Members of Congress, a commission would strengthen oversight and enforcement of the agreement. One panelist noted that an Iran commission would be unlike the Helsinki Commission in that it would necessarily require a major intelligence component and therefore may not be the best vehicle for driving public transparency. It could, however, still function as an active consumer for monitoring information and advocate for sustained resources for such monitoring. Iran Nuclear Agreement Review Act of 2015, Public Law 114-17, H.R. 1191, available at https://www.congress.gov/114/plaws/publ17/PLAW-114publ17.pdf. Joint Comprehensive Plan of Action implementation and verification and monitoring in the Islamic Republic of Iran in light of United Nations Security Council Resolution 2231 (2015), International Atomic Energy Agency, GOV/2015/72, December 15, 2015, available at https://www.iaea.org/sites/default/files/gov-2015-72.pdf. Joint Comprehensive Plan of Action (JCPOA), Annex I, July 14, 2015, available at https://www.state.gov/documents/organization/245318.pdf. Final Assessment on Past and Present Outstanding Issues regarding Iran’s Nuclear Program, International Atomic Energy Agency, GOV/2015/68, December 2, 2015, available at https://www.iaea.org/sites/default/files/gov-2015-68.pdf. 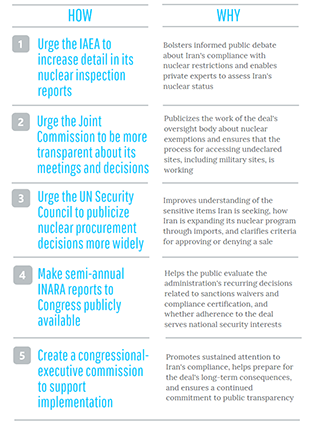 JCPOA, Annex IV, available at https://www.state.gov/documents/organization/245323.pdf. Nuclear Suppliers Group Guidelines, available at http://www.nuclearsuppliersgroup.org/en/guidelines.